AMC’s The Walking Dead season eight episode four ended with King Ezekiel (Khary Payton) returning to The Kingdom after the devastating loss of his fighters and the death of the heroic Shiva. Episode five returns us to Father Gabriel (Seth Gilliam) who’s currently stuck in a portable building with Negan. A flashback shows him praying for a purpose to his life. Another flashback sets up what was happening immediately before Negan stepped outside to negotiate with Rick and his men. Simon (Steven Ogg) serves Gregory (Xander Berkeley) pancakes and tells him he did the right thing by visiting the satellite outpost. Simon understands he tried to warn them all about the betrayal of Hilltop, Alexandria, and The Kingdom. Gregory’s been brought to the Saviors compound to solve the uprising. Gregory addresses Negan (Jeffrey Dean Morgan) and his main enforcers in a meeting room, beginning by discussing the management of resources. Negan admits he likes killing the right people at the right time, suggesting if you kill just one person you could be saving hundreds. Gregory figures out that’s why Negan’s group is called the Saviors. Dwight (Austin Amelio) excuses himself for a smoke, acting like he doesn’t want anything more to do with Gregory. Negan wonders why Gregory didn’t know about Maggie leading an army. Negan also believes Gregory’s being a typical politician playing both sides. Gregory keeps reiterating he’s always been loyal to Negan, and Simon believes him. Simon suggests to Gregory that now he needs to make Negan believe him. Gregory blames everything on Maggie taking advantage of him. Simon thinks they can send in enforcers to back up Gregory, returning everything to how it should be. Negan pounds the table, yelling that people are a resource and the foundation of what they’re doing here. He asks Simon if he’s confused about who’s in charge and if he’s backsliding. Simon says no, that it’s just a “pronounced event in a fragile moment.” Negan agrees and adds that they must win it all. Plan A will be to take Rick, The Widow, and King Assface alive and then kill them the right way. He wants everyone to watch as they die. As Negan’s talking, the sound of gunfire’s heard outside. Negan sees the cars outside have armor and decides they need to chat with the rebels. Back to current events, Negan attacks Father Gabriel in the trailer. He takes Gabriel’s gun, amused it has a full clip. The building’s surrounded by walkers and as time passes, Negan says Rick is an a**hole. Father Gabriel replies by calling Negan an a**hole. Negan tells Gabriel it was Rick who caused Glenn’s death, and then he asks why Gabriel stopped for Gregory. Father Gabriel says it wasn’t a pointless decision, and there had to be some reason he did what he did. “I think I’m here to take your confession,” says Father Gabriel. Rick (Andrew Lincoln) and Daryl (Norman Reedus) question the Savior who’s still alive from the truck. He says everyone was killed at the complex except the King, the Axe Man, and the Short-Haired Lady. Those three are the only remaining fighters and Rick is stunned. Negan believes if people think he’s dead, a lot of people will die because he’s not there to stop it. He claims he has nothing to confess and asks why Gabriel became a priest. Gabriel did it because he loves God and people, and wanted to help them over rough times. The Saviors’ leaders meet without Negan, and Simon reminds them they’re all Negan so it doesn’t matter if the real Negan’s not there. Regina wants to send out a fence crew to clear a path. Eugene (Josh McDermitt) disagrees, saying they’d be killed in minutes. Regina thinks they would use the workers as distractions, sacrificing them so they could send out small teams to warn the rest of the Saviors. Eugene shoots that idea down, and Regina suggests putting Eugene out there on the line. Simon and Dwight don’t think they should sacrifice the workers. They’re reminded about the snipers outside. There’s also a possibility they have a mole among them. Rick’s people know everything, thanks to a rat. Dwight takes charge of the meeting, saying they need to leave the complex. He even tells Simon he’ll lead everyone out himself, if Simon won’t. Simon actually agrees, but adds they’ll find the rat and kill him slowly. He stares at Eugene as he discusses the rat. 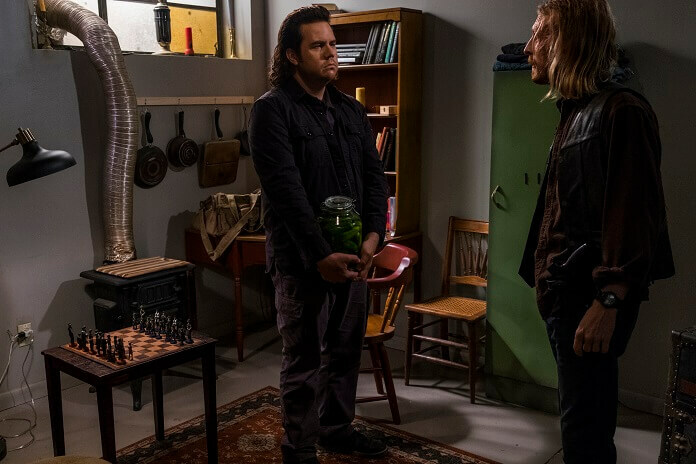 After the meeting, Eugene visits Dwight in his room. Eugene thanks Dwight for backing him up, and brings him some primo cucumbers. As he’s leaving, Eugene says he understands that he’s the prime suspect and doubly happy Dwight’s watching his back. Back in the building with Negan, Gabriel has discovered Negan helped kids before the zombie apocalypse. Negan used to show kids the way so they wouldn’t turn out weak. Negan then admits he’s weak, but killing the innocent isn’t why. As they speak, a walker punches through a wall. Negan wants to wait to see if they’re rescued before using any bullets. Negan says it’s not how he’s weak, it’s why he’s weak that’s important. He took the Saviors over and brought them all together. The former ruler let the Saviors be weak, and he has made them strong. He believes Gabriel now is his special project and they’ll find his purpose together. Gabriel admits he was at the satellite station and killed Saviors, declaring that he’s strong. Negan agrees killing sleeping Saviors is strong act, but that’s not the “strong” he’s talking about. Gabriel wants Negan to explain why he calls himself weak, asking if he wants absolution. He keeps asking him to confess, but Negan says he didn’t kill anyone who didn’t need it. Even the workers treated like slaves are that way for a reason. Gabriel brings up Negan’s wives and Negan responds by saying all the women made their own choices. Gabriel asks about Negan’s first wife and then attacks Negan from behind, grabbing back his gun and missing when he shoots. Negan fights back and then kills the walkers who are poking through the wall. As Negan’s distracted, Gabriel hides in a room inside the small building. Daryl heads down the embankment to the truck. It’s leaking gas as Rick joins him to remove the gun. They grab a box full of dynamite and Daryl suggests if there isn’t a Kingdom anymore, they have to blow up the Sanctuary. The walkers will kill everyone inside, if they don’t surrender. Rick reminds him about the innocent workers, and Daryl suggests they hit the side of the complex opposite the workers. Rick doesn’t like that idea because if they miscalculate, the workers could become fighters and pick up guns against them, something they might not have done without being attacked. Daryl’s done listening to Rick and says things have changed since so many have died. This is all on Negan, and now they have to look out for their own people. When Rick tries to stop him, Daryl punches him in the face. A fight ensues. Eugene’s playing a game when the electricity goes off. Rick and Daryl are still pissed at each other, but Rick reminds him they have to see the plan through. Rick then tells Daryl chokeholds are illegal. Daryl confirms he knows that. It’s time to set up the last play in this battle, and Rick heads off on foot. Daryl rides away, heading the opposite direction. Negan speaks to Gabriel through the door, telling him people are a resource and they have each other. If they make it inside, they live. Negan says he can also just kill Gabriel now, if he doesn’t want to work together. Gabriel admits through the closed door that he locked his congregation outside and listened to them die. He failed them, failed God, and was a coward. He’s working to lessen that sin. He offers Negan a pardon if they work together as equals, assuring him it’s the only way to a future. But, Negan must confess first. Negan thinks Gabriel did spineless sh*t and then talks about his first wife – his only real wife. Death did part them, but he admits that first he lied and cheated on her. She was sick before the zombie apocalypse and when she died during the zombie attack, he couldn’t put her down. That’s why he considers himself weak. Gabriel leaves the room and forgives him. Negan punches him in the nose, but hands him back his gun. Negan begins cutting up a walker and Gabriel helps him as they spread zombie fluids all over themselves. Covered, Gabriel and Negan bang on the walls attracting more walkers. They open the door and allow them in, and the walkers pass on by them as they scuffle inside. Gabriel and Negan make their way through the zombie horde, and Gabriel stumbles but rises. One walker attacks Gabriel and Negan defends him. It becomes an all-out battle for survival as more walkers attack. The Saviors’ leaders meet and learn no supplies have been delivered. The outposts have been attacked. Another Savior arrives to warn them the workers are coming upstairs. Simon goes out into the hallway to meet them, reminding them they’re supposed to stay on the ground level. He wants them to go back to the factory floor. The workers ask when the power will be turned back on, and Simon soon becomes upset with the workers and ready to kill at least one. The workers remind him they do the work, the Saviors protect them. Once more, they’re told to return to the factory floor. The workers ask about Negan and if he’s dead, and soon it gets rowdy in the hallway as more people yell out asking about Negan. Regina fires her gun and says she’s Negan. Just then, Negan and Gabriel make it into the hallway. Negan declares he has a leather jacket, has Lucille, and has a steel nutsack. He wants a shower, a meal, and a massage. Then, he’ll attend to some serious business. He wants to talk to his right-hand man, Simon, to figure out how this happened. The workers are thankful for his return, and Gabriel looks shocked at their reactions. Negan instructs his men to gently lock Gabriel up. Negan and his team meet once again and they determine the guns used by the rebellion were stolen from the armory. This is definitely an inside job. Eugene figures out it’s Dwight, but doesn’t say anything. Rick is walking toward the next stage of battle when a helicopter flies over his head. Yes, you read that right – a helicopter. Rick seems unsure if he’s hallucinating. Negan takes Eugene aside and lets him know that if he solves this thing, he’ll make him very happy. If he doesn’t solve it, he’ll kill Eugene quickly when they run out of supplies. Negan assures Eugene that either way he has his back. Eugene delivers a pillow and other supplies to Father Gabriel, reminding him through the door they’re traveling companions who’ve eaten dog together. He keeps knocking on the cell door, but Gabriel doesn’t answer. Eugene finally unlocks it to find Gabriel’s in bad shape, sweating and shaking. Eugene tells him he needs to get him to Dr. Carson, and Gabriel says that’s why he’s there. They need to get Dr. Carson – Maggie’s doctor – out of there.